Winter in Taiwan is the ... strawberry season! That's right, you read it right ... strawberries. Big. Red. Yummy. Sweet. Strawberries. 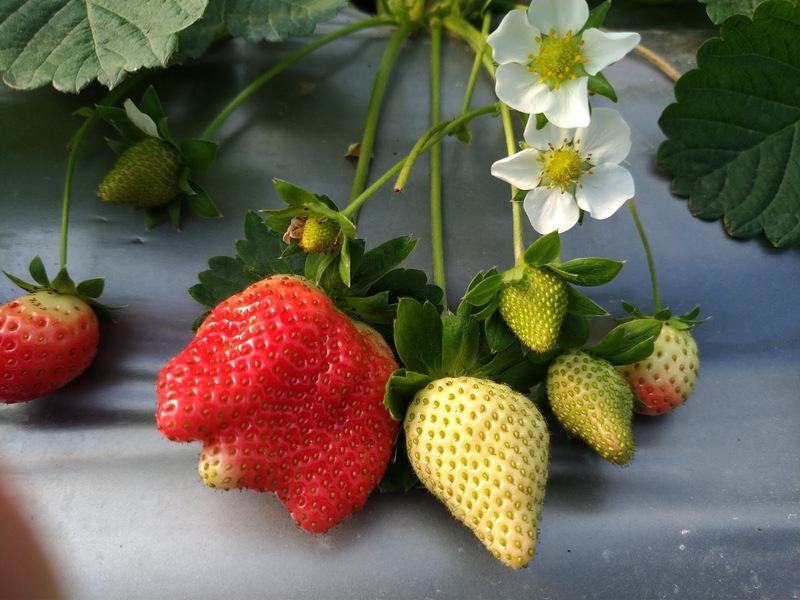 There are quite a few strawberry gardens right in Taipei and more precisely in Neihu 內湖. Many of them are located in one area, on the Bishan Rd. 碧山路There are also a few in Dahu 大湖. HERE is the list of some of the gardens. For the past few days the weather has been really nice - sunny and 20-25C. Nice weather like that can not last long during winter in Taiwan, so I decided to go strawberry picking as soon as the opportunity arose. Today was a perfect day. Out of all the gardens I chose the Baishi Hu Strawberry Garden 白石湖草莓園 at No.40 Bishan Rd. 碧山路40號. After filling our basket with strawberries we had some nice ice-cream. Close to the gardens there are two other interesting places to visit, the Houhu Wetlands 後湖濕地 and the Baishi Hu Suspension Bridge 白石湖吊橋. The Houhu Wetlands are just a few small ponds with wooden walkways. The place become popular with tourists because one of the ponds was shaped into a heart with a heart shaped island in the middle. The suspension bridge is quite long, but I was not able to figure out why it was built there 😁. Most of the strawberry gardens are open only on weekends, some open on Fridays. This shouldn't come as a surprise, because the fruits need some time to ripen. The Baishi Hu Garden is also usually closed on weekdays, but after calling a day earlier one can arrange a private visit. The owner is very nice and wanted to make sure that there will be enough ripe red strawberries for us to pick, so he asked me to call on the day of the visit to confirm. I truly recommend visiting this friendly garden.